Jill Lepore excavates the history of America, down to its bedrock values. According to Kemper professor of American history Jill Lepore, it was the edit that changed the nation. Her astounding new account of the American experiment—from when Columbus first stumbled on its shores to when President Donald Trump promised to put walls around them—is titled These Truths because of that substitution of evidence for reverence. Lepore argues that the revision meant rights were no longer “the stuff of religion” but “the stuff of science.” The founders grounded their principles in reason, not because it necessarily conflicts with faith, but because anything self-evident could be observed, queried, and debated. To walk such a path all the way through American history is an unlikely task for one of the country’s leading microhistorians, who previously focused her considerable intellect on obscure figures from Benjamin Franklin’s sister Jane to the peculiar psychologist who created “Wonder Woman,” using their lives to tell the story of broader cultural trends and historical movements. Delightfully, though, Lepore conjures a cast in These Truths every bit as unruly as those in her earlier histories: Quaker preacher Benjamin Lay, who made his pokeberry-juice trick-bible bleed; activist Phyllis Schlafly, A.M. ’45, who torched the feminist tent of the GOP one newsletter at a time; black entrepreneur and intellectual David Walker, who stitched his revolutionary pamphlets into the lining of clothes; Samuel Morse, who sped up communication only by accident, while trying to create a code Catholics could not decipher; “Amazing Grace” Hopper, who programmed some of the earliest computers for the Navy; and the Christian conservative Rod Dreher, whose blog decries the end of Christendom and conservatism with every post. In These Truths there are no heroes or villains, only Americans. But the book is more than a collection of profiles in chronological order; Lepore considers ideas as much as individuals. She divides the country’s history into four parts: its first 300 years, when ideas of natural rights were first taking shape; the antebellum nineteenth century, when arguments over popular sovereignty divided the nation; from Reconstruction to the end of World War II, when the nation state expanded its ideas of political equality; and the technological age that followed nuclear warfare, when machines disrupted democracy. Writing in an era of fake news and four Pinocchios, when truth seems anything but self-evident, Lepore insists that the United States was founded on facts—and more surprisingly, that only facts can save it. 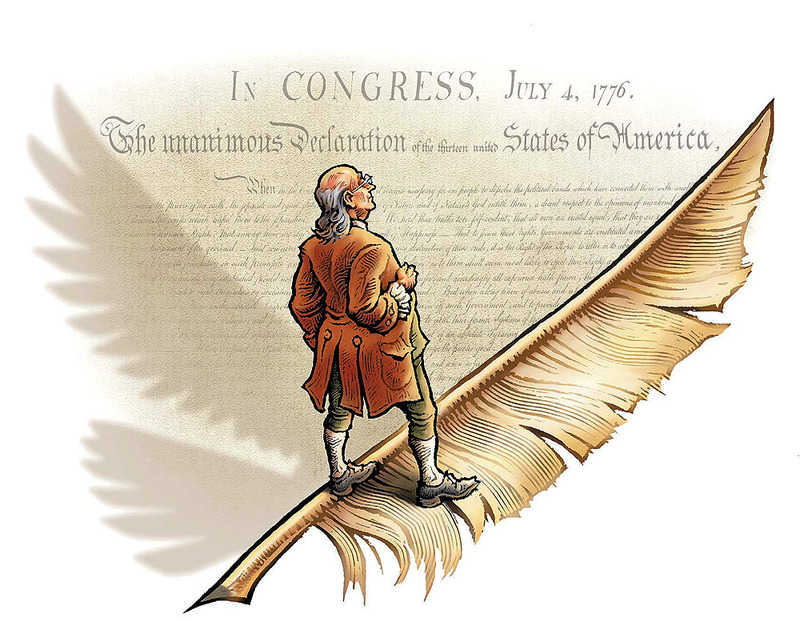 Within a few weeks of Benjamin Franklin’s edits, the Declaration of Independence was ratified, read aloud in taverns and town halls around the country, and reprinted in newspapers around the world. Not long after that, a slave rebellion started in Jamaica. The truths of the document proved so self-evident that enslaved persons were inspired to revolt, too, and right away Americans were forced to confront their own mendacity. “How is it that we hear the loudest yelps for liberty among the drivers of negroes,” asked the writer Samuel Johnson, in eighteenth-century England’s version of a hot take. Acknowledging the hypocrisy of men yelping for liberty while denying it to others has become standard for colonial histories, but Lepore goes further, arguing that the founders were not just hypocrites, but copycats: “A revolutionary tradition was forged not by the English in America, but by Indians waging wars and slaves waging rebellions.” Though the founders might have been reading John Locke and David Hume, none needed a treatise to know that tyranny could be resisted. They had heard about Metacom and the Algonquians who fought colonial encroachment in New England in 1675. And revolutions had been attempted all around them. George Washington’s slave Harry escaped Mount Vernon to fight for the British alongside a man named Ralph who had once been the property of Patrick Henry, while James Madison had to take a break from the Constitutional Convention to track down a 17-year-old named Anthony who escaped from Montpelier. Keeping the word “slave” out of the Constitution did not mean slavery was absent from the document; in fact, Lepore calls slavery America’s Achilles heel, narrating the tortured series of amendments, bargains, and compromises that only delayed the confrontation between the country’s commitment to natural rights and its failure to extend them to African Americans. Yet even after more than 750,000 men had died in the struggle over emancipation in the Civil War, the question of citizenship remained fiercely contested. The Fourteenth and Fifteenth Amendments were drafted to preserve the rights of freedmen, but the substitution of “male inhabitants” for “persons” left suffragists protesting for the rights of women, and two decades later the first federal immigration laws revealed how the rise of nativism constricted the notion of political equality even more. “The Confederacy had lost the war,” Lepore argues, “but it had won the peace”—not only because the South retained so much political power, but because not all men were equal, not all persons could be citizens, and not all citizens were afforded equal rights. The country’s commitment to its self-evident truths was wavering at best, and the decades after Reconstruction are some of the darkest in Lepore’s doorstopper of a book. These are the chapters where the very populism that tweets all day every day these days first appeared in the form of William Jennings Bryan, and the muckraking journalism of Nellie Bly, Ida B. Wells, and Ambrose Bierce was met by the yellowing prose of publishers like Joseph Pulitzer and William Randolph Hearst, class of 1885. In these years, America Firsters first appeared, and African-American soldiers fighting for freedom around the globe asked when they would find it on the home front, only to learn that Japanese Americans there were being forced into internment camps. Whatever their enemies abroad, Americans were also fighting a domestic war between the forces of corruption, demagoguery, prejudice, and propaganda and those of reason, reflection, and truth. Although the country had survived earlier periods of extreme partisanship, like the fights between Federalists and Democratic-Republicans in the 1790s, and Whigs and Democrats in the 1850s, political squabbles in the years after World War II started to seem more intractable. In these times, many will read These Truths like a dying man reading a first-aid manual, but history is not self-help. Technology had always fostered partisan divisions: printing presses arrived not long after the colonists did, and after that it was cheaper paper that divided opinion, then the telegraph and the radio. But Lepore argues that “Hiroshima marked the beginning of a new and differently unstable political era, in which technological change wildly outpaced the human capacity for moral reckoning.” The computers that broke German ciphers and calculated the trajectories of Japanese bombs were soon taking inventory, managing payroll, and sorting voters. It had taken a lot of shoe leather, postage stamps, and newspaper ink for the first consulting firm—Campaigns, Inc.—to torpedo President Harry Truman’s plan for universal health insurance. Now public opinion could be manipulated via mass marketing. Televisions went into almost every parlor, and smartphones, in time, into almost every pocket. In between, conservative intellectual Richard M. Weaver argued in his 1948 book, Ideas Have Consequences, that a commitment to deep truths had been replaced by a shallow concern for facts, and Cold War diplomat George Kennan worried that the paranoid distortions of McCarthyism were not a fluke but a feature of modern politics. Although politicians have always used history in selective and self-serving ways, both Democrats and Republicans began to see it as a palliative discipline: the party of the past peddling a fairy-tale version of a homogenous, prosperous nation that never was; the party of progress insisting on a narrative of advancement that has only occasionally been true, and never for everyone. Both parties were selling these stories as network television and daily newspapers declined and the balanced-coverage regulations that once governed the airwaves were repealed. Collective truths and collaborative discernment were even more imperiled by Facebook, YouTube, and Twitter, where partisans could post without meaningful rebuttal or rebuke. Tea Party types can put on Patrick Henry costumes without ever reckoning with Gabriel’s Rebellion, the slave uprising that took place just down the street from the site of his most famous speech in Richmond, and Democratic Socialists can hum Hamilton lyrics without ever walking from Trinity Church to the African Burial Ground in Manhattan. More insidiously, whole swaths of the country can like, favorite, and scroll until their thumbs fall off without ever knowing basic facts about their democracy, including election days. Perhaps instead of the next U2 album, Apple could make a copy of These Truths appear on every iPhone—not only because it offers the basic civics education that every American needs, but because it is a welcome corrective to the corrosive histories peddled by partisans. In these times, many will read These Truths like a dying man reading a first-aid manual, but history is not self-help. Jill Lepore is at her best when she is describing what has happened, not prescribing what should; the book’s weakest pages are the final ones, where she lapses into prediction, and gets lost in a strained metaphor about the ship of state righting itself. But the first step in self-help is to know thyself, and Lepore can certainly help with that. She has assembled evidence of an America that was better than some thought, worse than almost anyone imagined, and weirder than most serious history books ever convey. Armed with the facts of what happened before, we are better able to approach our collective task of figuring out what should happen now. Casey N. Cep ’07, a former Berta Greenwald Ledecky Fellow at this magazine, has written for The New Yorker, The New Republic, and The New York Times. Her first book, Furious Hours: Harper Lee and an Unfinished Story of Race, Religion, and Murder in the Deep South, is forthcoming from Knopf.